The TruckNet UK Drivers RoundTable • View topic - South Wales Hauliers sixties and seventies onwards. South Wales Hauliers sixties and seventies onwards. This thread is now in the capable hands of pete 359 ( Andrew ) ex Joint Motorways driver. Last edited by Dave the Renegade on Thu May 10, 2012 8:43 pm, edited 6 times in total. Alte Express, Drivers Eric Coventry, Henk!!!! Yellow with Brown band, cracking lads. Shipped out of Sheerness alot. Mercedes and Crusader 6x4 Detroit, nice. Location: Kenilworth, UK, formerly Manitoba. Also Gwynne Bowen, Trevor Phillips of Cadoxton plus many more big and small hauliers. Rosser,Pontillw,ran his MK3 and MK5 AECs to the end. John Raymond,Bridgend of course,who could forget him. Edwards of Lydbrook - an englishman sneaking into Llanwern . Entress,Llansamlet,ran Leyland Octopussies and then later Volvo F86s. Coastal Roadways,Hemphills and Wincanton all ran out of BP Baglan Bay. Calor Transport,on a roundabout on the A48. Blue Line Transport,Tondu ended up as Carline Transport I think.Way after my time though. Steel Company of Wales ran their own transport before nationalisation I think. And there was always an endless procession of GKN motors at night,Heath Street Division was one I recall. That's it at the moment, nurse is here with me medication. As you mentioned Edwards of Lydbrook, there was also Richard Read of Longhope as well as his brothers Harold end Fred who all had fleets, Fred operating from Hereford, I think there were six brothers all in transport. Two still operating. Does anyone remember going into BOCM and Spillers at Cardiff and Avonmouth docks in the fifties and sixties also Barry dock. Last edited by Dave the Renegade on Thu May 10, 2012 8:44 pm, edited 1 time in total. Dave the Renegade wrote: As you mentioned Edwards of Lydbrook, there was also Richard Read of Longhope as well as his brothers Harold end Fred who all had fleets, Fred operating from Hereford, I think there were six brothers all in transport. Two still operating. Doe,s anyone remember going into BOCM and Spillers at Cardiff and Avonmouth docks in the fifties and sixties also Barry dock. The Read brothers were Richard, Harold, George, Ivor and Fred who were all in transport. Brother David had coal lorries in the Oldham area I believe. Regarding Avonmouth, I used to go with my dad to BOCM and Silcocks for bags in the '60's, he drove a Seddon (Reg JMO 1) for Laws Transport in Reading. Fond memories. I drove a seddon 13/4 four wheeler with a perkins 6354 engine not a very nice lorry at all, offset steering wheel a poor mans leyland comet ( ergnomatic cab ).As you mentioned avonmouth in the sixties was a very busy port with lorries from all over the west country south and mid wales collecting animal feeds from the different mills. Last edited by Dave the Renegade on Thu May 10, 2012 8:45 pm, edited 2 times in total. Re: South Wales Hauliers sixties and seventies. boss asked me if i have done any overseas work ,i said yes,the isle of wight.he said i dont call that overseas, i said you try walking there! Welcome to the site Bob, brilliant for anyone who has or still has an interest in trucks. Keep on breathing, it helps. Educated in the School of Hard Knocks and the University of Life. Ianto,I did the same a few years earlier, went Avonmouth, Cardiff and Barry with my Dad or one of his mates fetching bagged animal feeds. I drove a FFK 140 with an underfloor engine, most of the four wheelers at that time could carry 10 tons, although only marketed as 8 ton payload, 14 ton gross, was the legal limit until the transport bill changed it to 16 tons gross. Thats a Carmarthen number bx if I'M right. Glyn John Transport ? cant remember exactly where they were from - used to run a few Transcons - late 70s. I fetched pipes from Albion concrete at Llangadog with a BMC FG IN 1968, it was only a four ton payload builders tipper, but I regularly carried six ton on it, running from Llandovery up through to Trecastle used to take forever, the lorry was only six months old, but only had a four cylinder engine. I was twenty years old. I then moved up to a Bedford TK tipper at 14 ton gross. Ilive 7 miles from Knighton Ianto, went to school there. I later drove for S W Brisbanes next door to Radco's yard, its still there,Clynderwyn farmers and Henry lea Oakes run a couple of feed bulkers out of the yard now, the rest of it is used by a couple of Hauliers as an operating centre. Last edited by Dave the Renegade on Thu May 10, 2012 8:46 pm, edited 1 time in total. 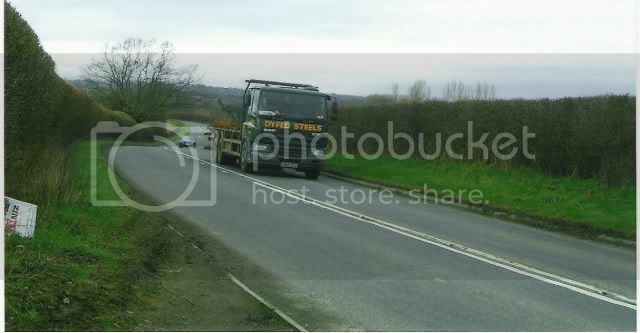 One of Dyfed Steels at Willersley A4111. Mr Alan Price of Bargoed,then trading as Alan Price + Sons, Red Ash + Shale. In the early 60s my dad did night trunk for Hawthorns from Swansea, waste paper down & cannot remember what he brought back, used to hand over to his day man in Oxford. His Depot Manager in Wales was George Hicks, who went on to start/run Hicks & Son, blue & white wagons doing European + Middle East. I remember the old man saying he went down one night & had a message to call in the depot, on arrival Goerge Hicks said they needed his wagon for service & to take the one parked across the yard. Dad said "Here George, its gt no plates on it & no discs in the screen!" The old man was told to pull over by it & drop his trailer, then a fitter was sent across & he took the number plates off dads wagon & screwed them on the bumper of the other one, & th discs were swapped the same, the old man was told to call in the next night & pick his wagon up! Skilled artisan's aren't cheap, but cheap artisan's aren't skilled! Am I right in thinking that Alan Price used to run quite a few Ford Cargo six wheeler tippers, all with a Michelin Man on the roof? Or am I getting them confused with someone else? Does anyone have any pics? Mark,you and your Ford Cargo's! You are correct Alan Price did run 6 wheel cargo's,with the Michelin men.This was carried over from the days they fitted them to their 8 wheel Deutz's,which also had air horns. I was working there when the first cargo came on a Y plate,with a V6 air cooled Deutz.An alloy body was transferred off a D series Ford and she was put to work, running shale from Merthyr Vale to Dowlais top,then running over to Vaynor quarry for roadstone used on the A470 by-pass.It had a payload of 17+ tonne, and did loook the part.I believe after the miners strike a batch of 4 were added replacing 3 D series Fords,and the last 2 road going Dodges. I never did get to drive one,as shortly after the first one arrived I moved to London,but a few of my friends had them and spoke highly of them. The D series was always a comfortable cab with good visability,mine had a two speed eaton rear axle, and would out pull those with the roadranger 4+4 box, my only negative point would be tfhe brakes or lack of. Needless to say the cargo became a legend in its own right. Here in the States,you will find them under the Ford,Sterling and Freightliner badge. They never brought the Euro-Cargo over,and with Mercedes Benz closing their Sterling plant the cargo is due to be retired. Thanks very much for your reply and the interseting info it contained. I have a bit of a soft spot for the Cargo and the earlier D series as my dad was involved with them for a while. Suedehead wrote: Glyn John Transport ? cant remember exactly where they were from - used to run a few Transcons - late 70s. Glyn John were based near Pontypridd and owned by Liners who made products from gelatine. They bought Ely Transport who were based at Culverhouse Cross at the top of Cardiff (now a big roundabout with BnQ on it). Glyn John ran Seddon Atkis, Ely had Volvos, F86 and F88s a few Ford Transcontis and old AECs. In the 90s they moved to the Docks and had Ivecos and Mercs. then bought by a Manchester group BFI, who also bought Febrys, Prices amongst others and them closed the lot of them. Blue Line tan Atkinsin Borderers out of Margam steel works. My father drove for Ely Transport and had in the 60s/7 a mk 5 AEC, CUH @@@B. I went with him several times as a boy, it was a flying machine and could keep up with Scanias which were just coming in then. About 20 years`later I was driving from seeing a customer in Llanelli and what do I see going up the long bank on the M48 with a coil on....the same wagon in Prosser colours, at least 30 years`old! Prosser at Pontllew used to run old AECs between the tin plate works around LLanelli (Treostre) My dad tell me they used to buy all the old AECs from Ely and Prices and then run them for another 20 years! Here it is,if you want to revive it,or if you wish,start another. thanks for that,it's so sad to see what little is left of the once thriving south wales haulage industry/companies.the only really large one now are owens,they recently moved out of what was joint motorways yard on the docks at port talbot,joints where located there for around 30 years.both my father and i drove for them and painted their fleet.john raymond another large (though not as big as they were)welsh firm seemed to have survived with rockwool,tesco and other contracts.both raymond's brothers used to be in haulage,argosy and vale transport respectivley.blue line became carline then stiller bought them and they have now all but disapeared off the south wales radar.it's difficult to explain without boring you all ( i hope i am not) the importance of "the abbey" steelworks at margam to all of these and the many more firms that relied on the steel traffic,to give you some idea joint motorways (just them) used to tip well over 100 loads of steel everyday from "the abbey",the dozens of others would do at least the same.now what bulk tonnage does leave is delivered to roundoak in the midlands by rail,the rest is auctioned off on-line to the lowest bidder.sorry to be negative.that's the problem with the truth,it hurts. Quite agree its sad to see all those transport firms gone,its pretty much the same all over the country. Around this way Roberts of Knighton ( Atkidave has a thread on here about them ) are no more,just over the border in Shropshire Lloyds of Ludlow are only running a couple, D & N Morgan from Craven Arms finished years ago,Swains of Stretton finished,but Steve Swain runs several from Shrewsbury under the same colours. Keep them coming Pete,I used to see all those firms you mentioned,be nice to her a bit more about them. sure it will give myself, Dave and many others some good reading. If you look at the top of the page ROG has put some helpful info about posting pics,sorry if I'm telling you something you already know,thats how I learn't.